If you're looking for my "Writer's Workshop" post, click HERE. We had this Roasted Vegetable Couscous as a side dish along with a Sirloin Steak last night, but it would easily make a hearty main dish if you're vegetarian or for Lenten Friday night dinner or lunch. I had some Eggplant, Zucchini, Yellow Crookneck Squash and Onions readily available, but you could add any veggies that you wanted to. Just make sure that they are like textured veggies so that they will cook evenly at the same time. Just cut the vegetables into cubes of similar size and toss them with a good drizzle of olive oil, a few teaspoons of your favorite herbs and Kosher Salt and freshly ground Black Pepper. For this batch, I used Oregano, Marjoram, Basil, Thyme and a little granulated Garlic Powder. 20 to 25 minutes, checking them and turning them every 10 minutes or so. This pan took a total of 35 minutes to reach the right level of doneness for my tastes. In the meantime, get your Couscous measured out and put the kettle or a pot on the stove with enough water/broth to equal 2 times the amount of couscous. You don't want to overly brown or caramelize your veggie because you want them to retain plenty of their moisture. After the water or stock comes to a boil, pour it over your couscous and seasonings, add the oil or butter and give it a good stir. Quickly cover the bowl with plastic wrap or a tight-fitting lid and let it sit in a warm place for 5 to 7 minutes. 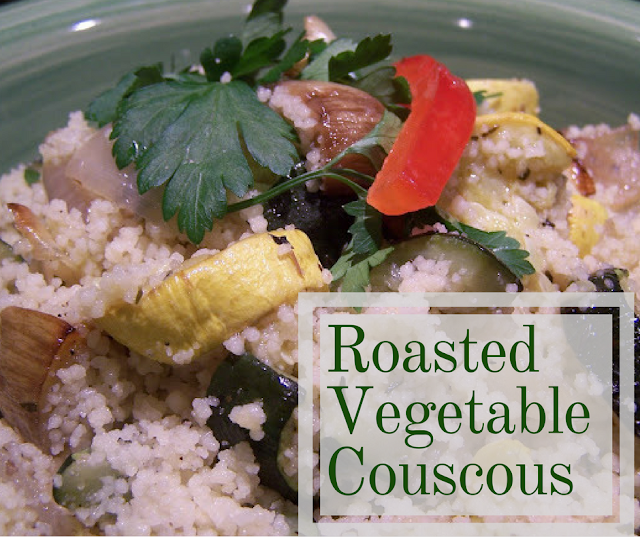 When the couscous is done, uncover it, fluff it with a fork (just as you would cooked rice) and add in your roasted veggies. I drizzle just a wee bit more olive oil in just to get it to the consistency that I like. Taste for seasoning and add a bit more salt and pepper, if needed. Serve this as a meatless main dish or as a side with your favorite meat, poultry or fish. One of the best parts about this dish is that it doesn't have to be piping hot when you serve it. I actually prefer it to be more on the warm to room temperature side. Hubbs grilled up a lovely Sirloin Steak (to a perfect medium rare) for us and we had this as a side dish. I love that I didn't have to make a veggie side to go with it! Time and step savers are always a plus in my book! Aha...we are on the same wavelength. I made a veggie couscous this week too...not roasted though. Yummy all the same. That looks good, I will try it! Thanks so much for putting my St. Pat's Blog Crawl Button up! Elena: Thanks! Hope you enjoy it if you get a chance to try it. Maureen: Great idea! The roasted garlic would work perfectly. It won't burn like the fresh stuff will. Liza: I guess we are! LOL I saute mine sometimes too. Depends on my mood and my schedule. Definitely delish either way! Kathleen: You're welcome! I can't wait for the party! Pat: Thank you! I hope you do get a chance to try it. Please let me know if you do!